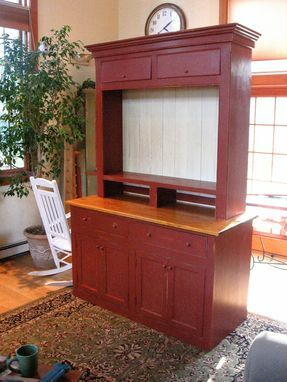 Custom pine cabinet made for client who wanted a large enough space to hold a 50 inch television. In two pieces. The bottom has a painted distressed two tone finish with a stained top. The drawers are maple and dovetail construction with self closing slides. The upper unit is the same pine distressed painted finish with ivory bead board crackle finish. The top drawers hinge upward to hole DVD's and CD's. Dimensions: Varies according to client needs.